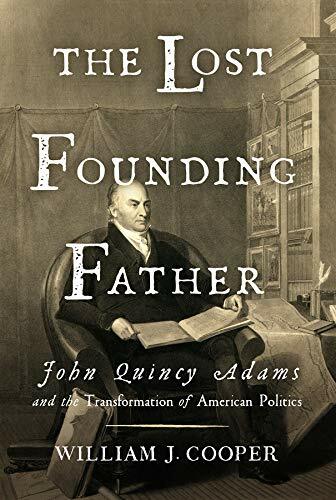 Some scholars would not identify John Quincy Adams, president of the United States and son of President John Adams, as "largely written out of American History when he is, in fact, our lost founding father" (from the book's promo). JQA, however, does merit serious attention. Noted historian William J. Cooper rightly puts the problem as Adams overshadowed by the momentous times and controversies of the beginnings of the United States and the rise of Jackson and the coming Civil War. Historians even remember the conflicts of John Adams' presidency better than the considerable controversies of JQA's presidency. "He viewed himself as an artifact, as did many contemporaries," Cooper writes. Adams "clung tenaciously to values and an outlook much closer to those of the Founders." The same man who gave us the famous Monroe Doctrine in foreign affairs and the Smithsonian Institute also signed the infamously divisive Tariff of Abominations. "No one else of his generation of American leaders" or almost anyone else, Cooper writes, "experienced Europe as a youth" while accompanying his father in diplomatic missions. As diplomat, Secretary of State, and later President, John Quincy Adams made important lasting gains for through foreign affairs. JQA did not embrace politics but ideals. He did so, unfortunately, in a time of rising partisanship where no public figure had the luxury of not taking sides, resulting in his isolation and a misunderstanding of his policies, a problem for the best of our leaders today. Adams did receive political appointments, including to the United States Senate, however. The Lost Founding Father offers no satisfactory explanation on how Adams achieved that outside of politics. Like his father, JQA had opinions that he had to express but "exerting oneself to obtain office violated his sense of himself." While he found "political award would result from his worthiness," he also offended as often as he inspired in those partisan times, as he did when he defended successfully the slaves of the Amistad. Adams earned his important diplomatic positions by an extensive education and experience and he obtained the position of Secretary of State "an official stepping-stone to the presidency" from the ultimate non-partisan President James Monroe. As Secretary, he determined "to maintain, even to advance, his country's stature in the world" beyond any politics. Adams fought for progressivism against the negative reactionary populism of Andrew Jackson "that fundamentally altered the political world." After losing reelection to his enemy, as his father had, Adams "declined to remain in isolation" and had an remarkable if cantankerous post White House career. Later as a congressman, Adams spectacularly "lost against what he deemed to be an essentially un-American South" and "the evil institution of slavery it defended." He "never surrendered his vision," however, and proved right in the great long term. American historians had come into their own by the time of Adams death. They did not see him as the lost founding father but they did recognize Adams as marking an important transition in American history. Cooper "in trying to understand Adams in his own time" honors that tradition with an engaging and engrossing prose style oriented on the great issues of those so-called giant days. Unwavering purists of the rules of writing will have issues with this book, however. If only we had such words—and learned such lessons—for today's politics. In The Lost Founding Father Cooper speaks to our times on national best interest in opposition to partisan politics.